1. Peak Oil. The notion of peak oil revolves around the finite limits of the earth’s petroleum supplies. While it is common knowledge that the earth is running out of oil, most people take some assurance in the idea that the world’s supply of oil will probably not run out for a couple of generations. But the concept of peak oil focuses on a related and perhaps equally important idea that at some point in the very near future, the global extraction of oil will pass its peak and begin declining. The mere fact that oil production will be in decline could have dire consequences. M. King Hubbert made the initial calculations in 1956 and came up with a logistic model that represented the likely rapid decline in world oil production after the production peak has been passed. When the peak of oil production is passed, the models predict that there will be a rapid rise in world energy prices, which will likely have grave economic consequences. If you are an optimist, you might believe that the world will successfully, if painfully, make the necessary shift to alternative energy sources, such as solar, wind, thermal, tidal, biological, and nuclear sources as the oil resources peter out. If you are one of the many pessimists on this subject, though, you are likely to believe that the drop in oil production will be too rapid to allow enough time for the world to make the needed transition to the alternative options. Michael Ruppert is a pronounced pessimist and has spent the last thirty years as a self-employed journalist arguing his case to any and all who will care to listen. In the film Ruppert articulates quite clearly the theory and facts behind peak oil, and they appear to be based on sound evidence. He points out that much of our worldwide transportation system is based specifically on oil, and it cannot easily be served by alternative energy sources. For example there are eight gallons of oil in every automobile tire, and even electric cars will need to run on wheels of some sort. We can’t simply switch to plastic, because they are all based on oil, too. A key notion in this connection is EROEI (Energy Return On Energy Invested). This measure is the ratio of the amount of usable energy produced divided by the energy required to produce it. Clearly only energy sources having values of EROEI greater than 1.0 are of any practical use. (There are different ways of defining and calculating this ratio, which has led to some criticisms of published values, but this is only a minor detail to the overall argument.) Unfortunately, the EROEI values of the alternative energy sources on the horizon are not nearly as good (not as high) as what we have enjoyed with petroleum during the 20th Century. So even with alternative energy sources available, the efficiency of energy production will be greatly reduced. Suffice it to say that the peak oil discussion is significant and worthy of everyone’s consideration, and Smith and Ruppert present the gist of the argument succinctly and with gusto. 2. The Economic Collapse. Ruppert is also one of the pessimists who believe that the immediate aftermath effects of peak oil will lead to an economic catastrophe and a complete breakdown of societies all over the world. Here the argument is highly speculative, but one must consider the possibilities. With the rapid rise of the world’s population, from 2.5 billion in 1950 to almost seven billion today, there are enormous demands for energy, food, and water. These are likely to come into short supply after the oil peak, and this could lead to massive catastrophes – it is not so easy to shrink the world’s population back to manageable numbers in a short space of time. Another thread to this narrative concerns the enormous amount of leveraged debt in the today’s globalized society, which Ruppert feels will intensify the economic collapse. Ruppert refers to “fiat money”, the tendency of governments simply to print paper money in order to increase credit and “pay off” existing debts. Ruppert’s doomsday vision is underscored in the film by numerous lurid archival film clips of war, famine, and massive social chaos. None of the predicted calamities is provably correct and inevitable, but they are plausible; Ruppert is right that sweeping and hitherto unprecedented measures will have to be taken in order to deal with these issues in the relatively near future. But the emphasis here is not on any proposed remedies, but on the horrors of the impending disaster, itself. In any case this is the aspect of the film that will strike fear in the hearts of many viewers and will have the most memorable effect. 3. Michael Ruppert, himself. But Collapse is not at all a typical polemical documentary like the carefully constructed and paced An Inconvenient Truth (2006), which seeks to mount convincing evidence in order to persuade a discerning viewer. In fact director Chris Smith seems to have adopted an equivocal stance with respect to his subject, and this is why some viewers are reminded of Errol Morris’s portraits, Mr. Death: The Rise and Fall of Fred A. Leuchter, Jr. (1999) and The Fog of War: Eleven Lessons from the Life of Robert S. McNamara (2003). 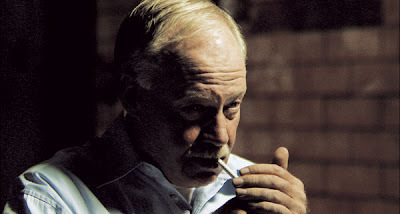 In Smith’s Collapse Michael Ruppert is displayed as an oddball, a lonely and obsessive maverick who seems to live in an alternative universe. Chris Smith shot the interviews with Ruppert in fourteen hours over four days, in a darkened studio that looks like an old warehouse. 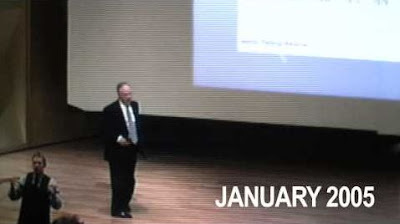 From this footage he edited the interview with Ruppert down to fit into the film’s 82 minutes of runtime. Ruppert is shown in stark lighting, sitting alone in a chair while he tells the story of his life’s travails. He was graduated with honors from UCLA and then became a police officer for the city of Los Angeles. But at the age of 27, something happened that altered the course of his life. According to his account he became aware of the CIA’s illegal drug operations in the United States, and when he attempted to report these activities, he became a target of the agency’s thuggery and feared for his life. This is apparently the background to Ruppert’s particular sensitivity to perceived conspiracies that are thought to be undermining American society and accentuating future risks. 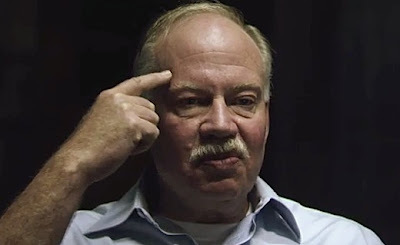 In fact Ruppert apparently also believes that there was a US government conspiracy behind the 9/11 (September 11, 2001) attacks, although these claims are not discussed in the film. All of this noirish mise-en-scene presents Ruppert in a rather negative light – as an outlier from normal society – and this was apparently Chris Smith’s intention. There are numerous shots of Ruppert taking drags on his cigarette, presumably to cast him as a rumpled and unrefined blowhard. At one point Ruppert even breaks down in tears as he reflects on his lifelong struggles to get out the truth. Amazingly, though, and despite Smith’s efforts to present Ruppert as something of a freak, Ruppert does get his story across surprisingly well. True, Ruppert is rather obsessive, but he is clearly intelligent, and he manages to make his case even in these difficult circumstances. In documentary films one always has to consider the two sides, so to speak, of the camera: what is in front of the camera and what is behind the camera. What Smith does with and behind the camera is not particularly praiseworthy. The melodramatic add-ons, both the background music and archival film footage, are presented purely for emotional effect and have little connection with the specifics of what is being said. In addition the heavy-handed portrayal of Michael Ruppert as a weirdo seems to me to be rather unfair to his subject. But what Smith has in front of the camera, Michael Ruppert, is what makes the film. Ruppert has a story to tell, and he makes the most of this one chance to tell it. And this reminds us of the inescapable truth of documentary filmmaking: there is no substitute for having the goods in front of the camera. What Smith has there is someone discussing issues worth your consideration.